Having problems with your computer? Not to worry! 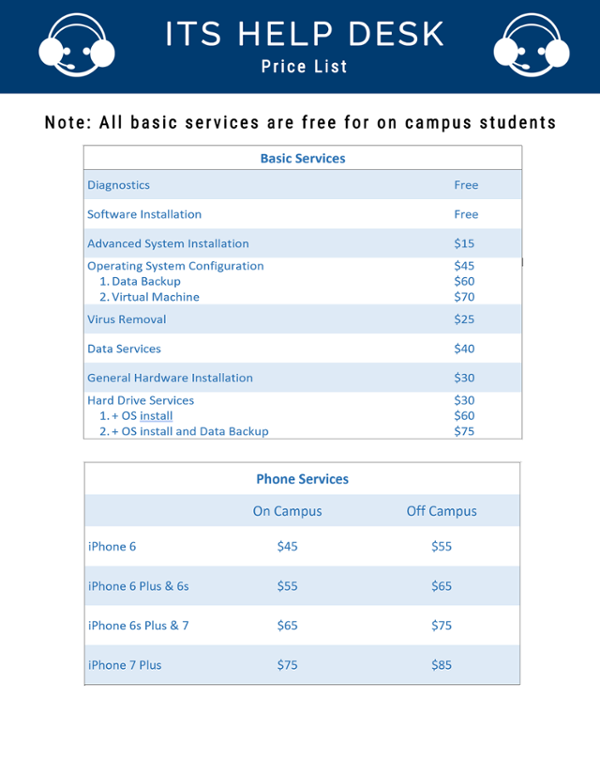 The ITS Help Desk is here to help troubleshoot and repair computers for all on-campus and off-campus students! We can remove viruses, speed up slow systems, troubleshoot Internet problems, repair cracked iPhone screens, and much more. Bring your computer to one of our locations: ITS Help Desk, located in Hahn University Center room 117 (near One Stop Services). On-Campus Students Receive Free Service and we offer competitive rates for Active Off-Campus Students, Active Faculty and Active Staff. Please see our Price Index below.